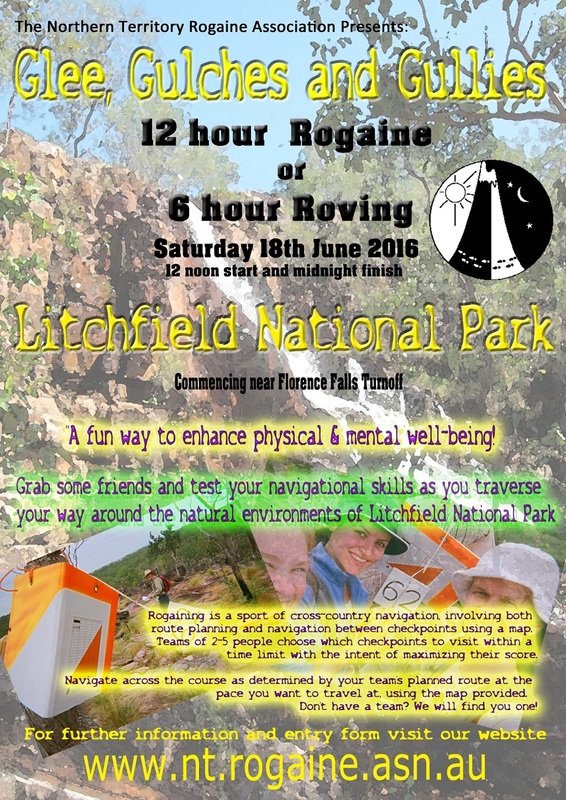 Join us for a 12hr bush rogaine and test your navigational skills as you traverse your way around the natural environments of Litchfield National Park. There will also be a 6 hour event within the event times from midday to midnight, more commonly known as a roving event. Competitors entering this event may come and go from the hash house but can only be on the course for a maximum of 6 hours. "Terrain is Savannah woodland, escarpment country, sandy plains with some rock features in the deeper gullies and some easily traversable rain forest. The course has been planned to be of a user friendly nature with an easy route choice between all controls, regardless of the attack direction." The hash house is a large area with plenty of shady trees to camp under and right on the edge of the course proper. There will still be creeks and waterfalls running in June. This is a very doable event for all-comers, with good points available to even the least experienced as well as a challenge to the experienced at the extremities."